We always have a time of prayer during our church services. The pastor reads out a list of all the people who have requested prayer (most of whom have requested prayers for healing, some of whom have been on the list for months, if not years), and then we pray together as a congregation. One thing I have noticed is that the list is never short. We are a small congregation, but that doesn't change the fact that there are many, many needs presented each week. There are those within the congregation itself who are sick and family members who are sick. There are requests for former church members and for friends of people in the congregation. We also have prayer for pastors of other churches who are sick...the list goes on and on. Of course, even with how long it is, the list is incomplete. If asked, probably ever person sitting in the church could add the name of someone they know who is sick or hurting or needs help in some way. Another thing I've noticed is that the list never gets shorter. Though names are removed from the list because the person has recovered from their illness or surgery, or because they have died, there are always more names to add to the list. There are always more people in need of healing from God. I will be honest here. I struggle a lot with the issue of healing. I believe that God has the power to heal. Jesus healed people while He was here on the earth, after all, and I know people who have been healed. God told the Isrealites, "I am the Lord, who heals you" (Exodus 15:26). I also believe that He cares for each one of us enough to heal us. But the truth of the matter is that many people are not healed in this lifetime. People struggle with chronic illnesses and disabilities. Why? Cancer continues to attack too many families and to take the lives of those who are too young. Why? I read last week about the passing of little Eleni, whose 10 months of life were full of pain and difficulty. Why? Zachary was asking questions about his Bible reading yesterday, unrelated to sickness and healing, but Paul's answer strikes me as being appropriate here too. Paul said, "We just have to trust that He's a righteous God and that he's doing what is right." He also said, "I know that's not a very good answer, but it's the best we can do." 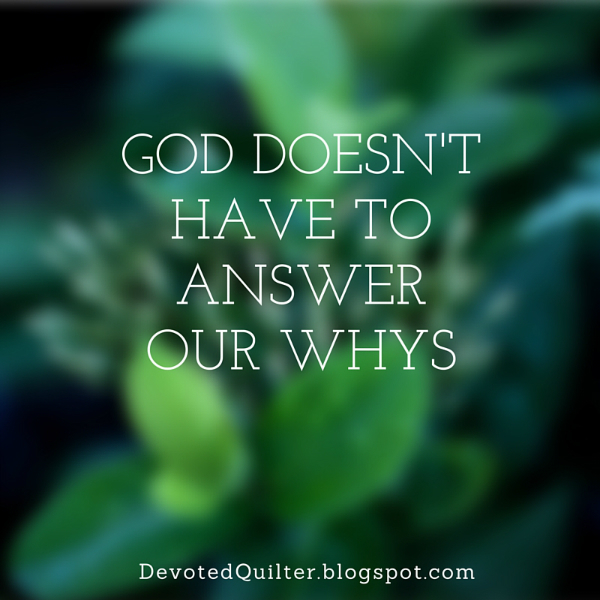 As much as we want Him to, God doesn't have to answer our whys. "For we live by faith, not by sight," the apostle Paul wrote in 2 Corinthians 5:7. That faith is hard, sometimes. The believing that even in sickness, pain and death God is in control, and that He is good; it's hard. But sometimes God does give answers. I read yesterday this letter Rachel wrote to be read at Eleni's funeral and cried over the beautiful answers she feels she has been given. How important it is for all of us to remember that any time of suffering here on earth will seem insignificant when compared with the length of eternity spent in a place where "God’s dwelling place [will be] among the people, and he will dwell with them. They will be his people, and God himself will be with them and be their God. ‘He will wipe every tear from their eyes. There will be no more death’ or mourning or crying or pain, for the old order of things has passed away” "(Revelation 21:3,4). Sickness and death were not part of God's design for us; they were brought into the world because of sin and so long as there are people living on this earth, there will be sickness, pain and death. But there will come a day when all of that is gone, and there will never again be a need for a prayer request list. Good message. I do not follow that blog so did not know about Eleni. How sad. Hope your wrist is feeling better. Beautiful post. At times, I just have to remind myself, that at the end of it all, I believe He is good. Even when I don't understand, He is good.